Compare Adobe Lightroom 6/CC vs. 5 – What Are the New Features? 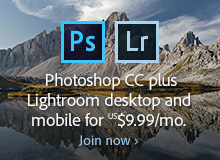 Lightroom CC is the same core program running on your desktop but in a subscription version that comes with the CC Photography Plan together with Photoshop CC, as well as included in all complete Creative Cloud offerings. CC subscribers will receive ongoing product upgrades (such as the new Dehaze tool), plus full access to Adobe’s family of Lightroom mobile apps & services for on-the-go use, sharing and syncing. For more details on these differences and the two options, see the Lightroom 6 vs. CC Comparison Guide. The brand new Lightroom free trial download always starts off as Lightroom CC, but after installation it can be converted to Lightroom 6 if that’s what you decide to buy instead… After you make the standalone purchase, the product branding will transform to Lightroom 6 and you will lose access to the mobile app and web features, as well as included future upgrades. Generally you can run the fully-functional free trials on your computer for 30 days, but it is possible to extend this longer if you need more time to evaluate the software. Importantly, the minimum system requirements for Lightroom have changed a bit. A 64-bit system is now required both on Windows (here’s how to tell) and on Mac OS. For Macs, you need to have OS X version 10.8 “Mountain Lion” or above (here’s how to upgrade free). Adobe has posted the official LR system specifications here if you want to double-check your computer to be sure. Note that Adobe is switching to an annual major release schedule with Lightroom now, and today’s version is officially known as Lightroom CC 2015. We don’t know yet what will happen next year with Lightroom CC 2016 and/or Lightroom 7; as always Adobe has not preannounced any future product plans. As far as product pricing goes, all prices for perpetual licenses remain the same, whether for full or upgrading from LR1-LR5… New, however, is that LR6 upgrades are available for purchase only through Adobe’s website direct. In other words, the discounted Lightroom 6 upgrade version is not being sold via retailers or resellers, but can be purchased online. What’s the Difference between Lightroom 6/CC vs. Lightroom 5? And for more in-depth on those new features, check out this detail page. Finally, one really big gain here is performance. The last two major releases of Lightroom (LR5 and LR4) were notoriously slow for some users, especially for folks with a lot of images in their catalogs and/or on older systems. Lightroom 6 has made huge strides with better performance, even on older (but still compatible) hardware. 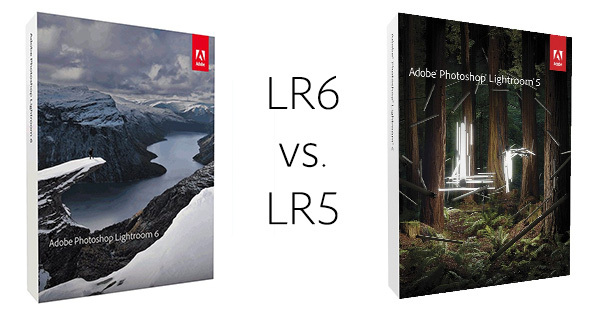 Lightroom CC vs. LR6: Which should you choose? Hi, thanks for the helpful version comparison. I have an older system running Lightroom 4, and it’s gotten to be a bit slow. I tried out LR5 when it came out but it didn’t run any faster. Now, I read about the big performance improvements in LR6 and was wondering if it will be worth it for me to upgrade. In other words, could I expect significantly faster performance even if I have a computer that’s a few years old? Hi John, thanks for your question. We can’t say for sure because we don’t know all the specs of your machine, but it could well be worth the upgrade for you. As long as your computer is 64-bit and running a supported operating system – plus has a GPU like most modern systems do (either integrated or a separate card), then what Adobe’s done in Lightroom 6/CC could make a big difference for you. 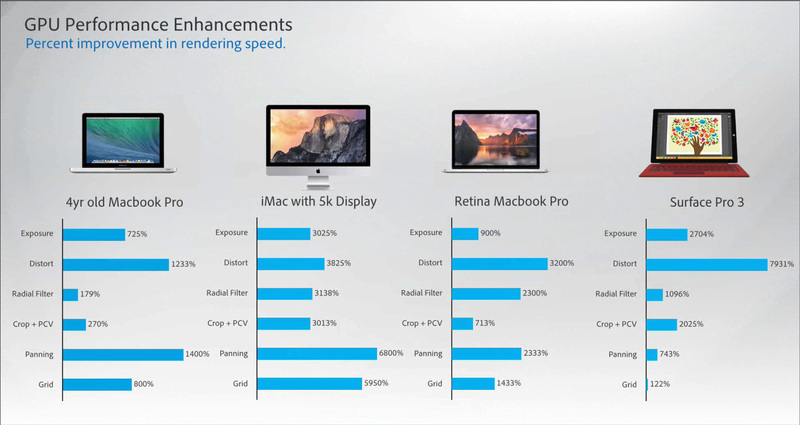 You can see some of these numbers given in the performance benchmark chart we included in the article above, with speed compared to Lightroom 5. What we’d suggest is to go ahead and give the new Lightroom 6/CC free trial a go and see how it works for you… You can run it alongside your current version and uninstall the trial later if you don’t want to keep it, without messing up your photo catalog(s). And if 30 days isn’t enough to fully evaluate the new software, then you could stretch out your free tryout period to 60 days. What’s the Difference Between Adobe Lightroom 6 vs. Lightroom CC? This new article gives the details on your options, plus tells you how to buy a Lightroom 6 standalone/perpetual license instead of a Lightroom/Photoshop CC subscription if that’s what you prefer. I downloaded Lightroom version 6. I thought it would remove LR5, but now I have two versions running on the computer. I was busy over the weekend using them and I did not notice that I know have two versions and they are running a separate version of my master catalogue. How do I combine the catalogues and delete v5.7 (which I also upgraded recently). I am a subscribing member of the CC Photographic package. Hi Peter, as with most major new Adobe releases, the previous version is not automatically uninstalled from your system – rather, that is left for you to decide whenever you are ready. That way there is no risk of interrupting your workflow if, say, some of your third-party plugins aren’t yet compatible with the new version, or if you want to take some time to transition over, get comfortable and come up to speed with the new release, or if there happened to be some features you’re using in the previous revision that were removed in the new version (none that we know of in this case). So you can have the two releases installed side-by-side on the same computer, or you can remove the older one whenever you want. We need to upgrade your catalog for use with Lightroom 6. Lightroom will create a new catalog file in the destination indicated below. The previews will also be moved to this location and converted for use with Lightroom 6. Select Upgrade below to begin. In any event, once the Lightroom 6/CC catalog upgrade process has taken place, you can go ahead and uninstall Lightroom 5 from your system and any time and then just carry on using LR6 instead. This demo will also show you how to rename the newly-combined catalog if you so desire. Hope that helps. If you have any further questions, then feel free to post back. The Lightroom 6/CC catalog upgrade process does not erase or remove your previous Lightroom catalog(s). If you’d like to try the free 30-day Lightroom 6/CC trial by upgrading your existing catalog, you may always return to earlier versions of Lightroom and continue using your previous catalog. Please note however that any changes or work completed in your Lightroom 6/CC catalog after it has been upgraded would not be available in previous versions of Lightroom. 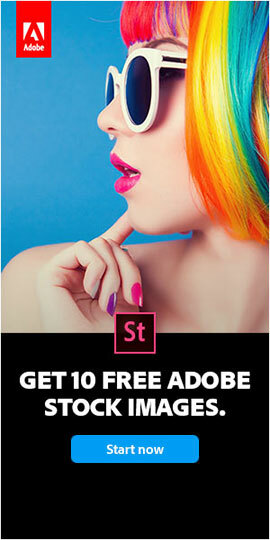 Read more about this from Adobe. Would you be able to do a benchmark comparison on a system running Intel Iris graphics and no discrete GPU? I’m trying to decide if it’s worthwhile for me to upgrade on my mid-2014 13″ rMBP. I just did a comparison using the LR6 trial on building 1:1 previews and got 2 minutes 47 seconds with LR6 vs 3 mins 15 secs with LR 5.7. That’s quite a substantial speed increase but I’m really not fussed about that sort of thing as I anyway leave it to run while doing something else. A more complex benchmark such as the one you ran would be very helpful. 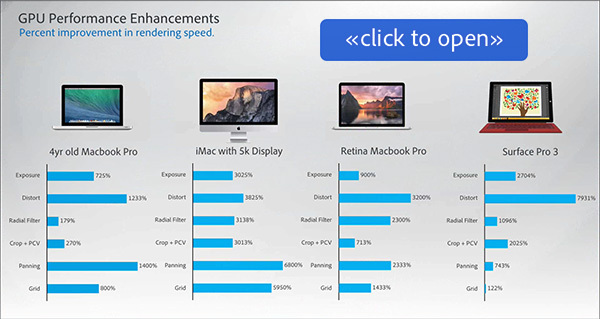 Maybe you could disable the discrete GPU on your 15″ MBP if you don’t have access to a 13″ machine? 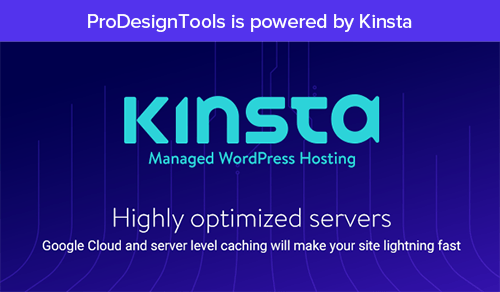 Not sure Kieran – if you are able to download and run the free Lightroom 6 trial on your own computer, and benchmark its performance vs. Lightroom 5 on the same machine, then why would you want data from other systems that you don’t own? Greetings John, Lightroom 6 added GPU acceleration but it’s brand new and there are cases of it not working out for some people… It’s also possible your graphics card may not be supported by Lightroom. So usually just turning that off in Preferences can fix an issue with Lightroom 6/CC performance. Before doing that however, please make sure the driver for your graphics card is fully up-to-date (check with your system and/or card manufacturer). Hey Tammy, not to worry. When you upgrade from any older version of Lightroom to Lightroom 6/CC on a given system, then you’ll be asked if you want to import/migrate your previous catalog(s) there. It’s all automatic from that point, and you don’t lose any photos. One thing you can’t do, however, is share the same catalog between two different releases of Lightroom. So yes, you’d have to upgrade your original/older computer to Lightroom CC as well (your iMac in this case). Question: Are you an Apple subsidiary? I am asking because you do not provide any performance compares for Windows-based systems, which are ultimately used by by some 95% users. No, not at all Thomas. But perhaps you didn’t realize that the Surface Pro 3 is a Windows-based system – in fact, it’s actually produced by Microsoft. In any event, those are the figures and benchmark results that Adobe provided us. In the Adobe customer world, it’s more like 50/50 between Windows and Mac OS. If we can get any additional performance figures for Windows computers, we will share them here. But the numbers posted above should be generally representative for what to expect depending on your class of machine. I bought LR 6. Can I upgrade to CC? Will I keep all my backups that I now have with an upgrade? Will I lose anything? Can I run Lightroom 6 on a WIN 7 32-bit platform? Hello Richard, per the latest LR system requirements, a 64-bit platform is now required both on Windows (here’s how to tell) and on Mac. For Macs, you need OS X version 10.8 “Mountain Lion” or above (here’s how to upgrade free). For PCs, it’s Windows 7 or above. 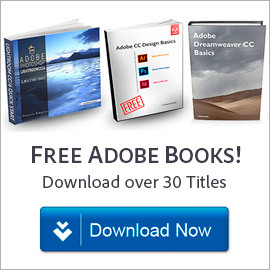 If you’re a CC subscriber with a 32-bit system, then you still have full access to download and use previous versions (such as Lightroom 5) instead. 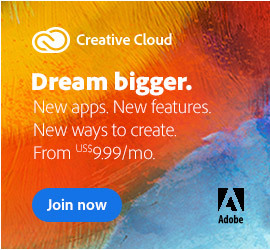 If I were to sign up for the creative cloud subscription and then later decide to cancel my subscription, what happens? Do I lose my license to run Light Room? 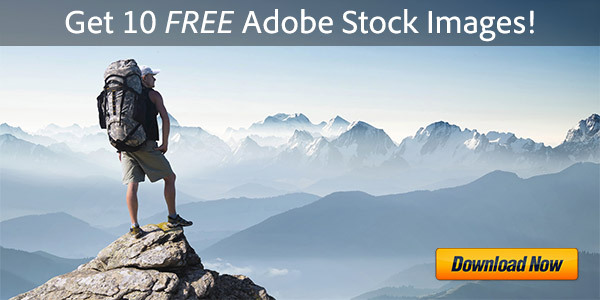 What Happens to Adobe Lightroom After My Membership Ends? I am interested in purchasing Lightroom 6/CC asap. I have a 2007 iMac desktop but anticipate buying a new iMac later this year. What is the best approach to installing Lightroom so that I can import all of my iPhotos, in addition to many non-iPhoto lecture jpeg photos, from both my old iMac as well as from my Mac Laptops. how do I download lightroom 6 after I have purchased it? Hi Forrest, Adobe should have sent you a download link or you’ll find it in your online Adobe account. Or, you could use the Lightroom 6 direct download links instead. LightRoom 6 is not opening after activating on win 10 pro x64, but I’ve only 128mb graphics memory on my pc. Well, you can try manually disabling the graphics card/processor in Lightroom… See the steps here. If I purchased Lightroom 6 and started the Lightroom CC Trial, what will happen after the 30 days? What if I don’t want the CC version. Can I go back to the original Lightroom 6? Both are desktop applications, but the all-new Lightroom CC uses the cloud for image storage, while Lightroom Classic is disk file/folder based. They maintain separate catalogs. So, if you want to simply try out the new Lightroom CC, then that will not conflict with your existing Lightroom 6. If you want to try out the new version of Lightroom Classic, then be aware that in each successive major version of Lightroom (e.g., 4, 5, 6, 7/Classic), the catalog format changes/evolves and improves, so it is not possible to take a catalog from a newer release of Lightroom and use it on an older release. What Happens to My Work When I Cancel My Subscription? After doing reading on the LR 6 vs. CC reviews, it makes me more nervous and cannot decide if I should purchase my upgrade or go on the trial because some of the customers have a run-in with issues and seem so complicated. Especially those not tech savvy to computers. I currently have a LR4 which is now no longer compatible to High Sierra on my MACbook Pro. So I’m now forced to upgrade my LR. I hear good things about LR6, but not sure it will slow down my workflow? It’s slow now but I am really on the fence. Can anyone really advise what I need to do before I really make the purchase. I’m not willing to throw away $80 like someone did on this thread. Please advise. Thanks. Greetings Lisa, did you see this analysis? In October, Adobe released new versions of Lightroom ‘Classic’ CC (this is the traditional LR app but renamed), and an all-new reimagined Lightroom CC app. Note that in each successive major version of Lightroom (e.g., 4, 5, 6, 7/Classic), the catalog format changes/evolves and improves, so it is not possible to take a catalog from a newer release of Lightroom and use it on an older release. So if you want to try out the new version of Lightroom Classic, then don’t move your primary work up to the new release until you’re ready to move forward. Great for the thorough input and advice. So much appreciated! I will do a trial and see if I like it. Looks like Adobe (and it’s not alone) is out to punish those of us who choose not to use the “cloud.” In my case I find internet service, and I’ve had more than one, too unreliable too use remote storage or programming. I’m surely not alone. I guess software companies have forgotten that typical users don’t have corporate-level internet connections. 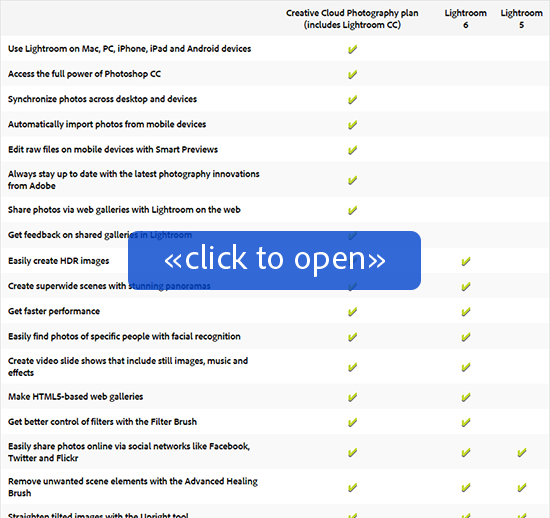 Bill – you do not need to store your photos online, nor do you need to run Lightroom “in the cloud”… You have the choice. What’s the Difference Between Lightroom CC vs. Lightroom “Classic”? What's the Difference Between Lightroom 6/CC vs. 5 - What's New?